On and off for nearly half a millennium, rural enforcers have patrolled the perimeter of a 42-square-mile high savanna called the Menz-Guassa Community Conservation Area, or simply, Guassa. Admassu Getaneh, a hired gun and former soldier, is here to make sure that no one steals or ruins the grass. 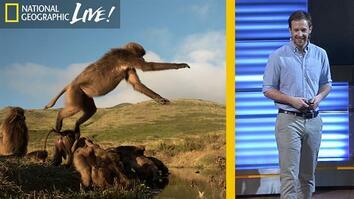 If you want to protect the world’s only grass-eating monkey, saving the grass is a good start. But native vegetation is everything in the highlands. Slender, sturdy stalks get strung into thatch and used for roofs. Men braid grass into rope. Women and children tie blades, sheaths, and stems into brooms and torches. Grass gets stuffed into mattresses. Yet across the misty highlands, where about 80 percent of Ethiopians live, grasslands, meadows, thickets, moors, and swamps are deteriorating into rock and dead earth. The population is exploding. Farms sprawl across damp, rich land, displacing native plants that help the ground hold moisture. Erosion wipes out 1.5 billion tons of topsoil annually, pushing subsistence farmers to even more marginal ground. This pattern plays out across Ethiopia—almost everywhere, it seems, except here. In Guassa the grass is high and wavy, the torch lilies and giant lobelia left to grow for years. It’s not a park. Local villagers run this place. A complex communal system determines where livestock grazes, who cuts grass, and when. As a result this landscape one-sixth the size of Nairobi is among East Africa’s healthiest. Nearly a quarter of the country’s endemic mammal species live here. There are about two dozen of one of the world’s most endangered canids, the ginger-furred Ethiopian wolf. 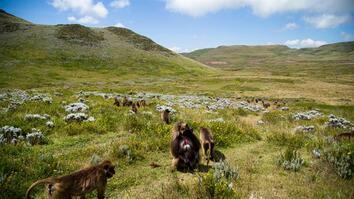 Guassa is a hot spot for klipspringers, civets, African wolves, and hyenas. 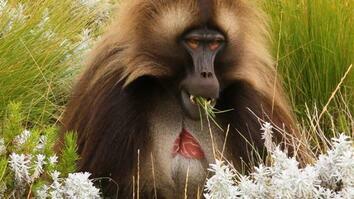 And unlike elsewhere in Ethiopia, its 800 or so chattering geladas live much as they have for thousands of years.